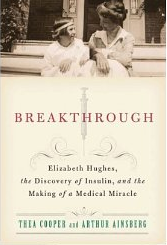 “Breakthrough” is the name of the book released last year that follows the discovery of insulin in 1922 by Dr. Charles Best in Toronto and one of its first recipients, Elizabeth Hughes, an 11 year old girl with type 1 diabetes. “Breakthrough: The Dramatic Story of the Discovery of Insulin” is also the name of the exhibit, based on the book, that just closed at the New York Historical Society. “Breakthrough,” of course as the book’s title, represents a medical breakthrough – the discovery of insulin. Now one could have diabetes and live. But now I find the word “breakthrough” bittersweet. As “breakthrough” is the dream that lives in the heart of all of us with diabetes still waiting for the big one almost 90 years later – a cure. I attended the exhibit a few weeks ago and particularly enjoyed seeing the antiquated pumps, meters and syringes patients had to live with only a few decades ago. I am eternally grateful that just about the time I got diabetes, 39 years ago next month, disposable syringes were already on the scene. Here are a few snaps from the exhibit. Apart from seeing what’s pictured here, however, the best way to soak up the story is to read the book.